60pp plus 4pp colour cover. Ghana's AEC logging trucks by Peter Fryer. A155, A161, A164 and A165 oil engines by Brian Thackray. Discovering a preserved S type. Southall News - Martin MacGregor writes about life with the company. The AEC/Camions Willème relationship by Bob Fryars. Preserving a bus and a Matador with Douglas Harris. Letters to the editor from Robert Bennet, Tom Cooper, Trevor Craib, Peter Fryer, James Gilman, Paul Kelly, Jim King, David Luck, Brian Rushby, Alan Townsin, Nick Sloan. Nine new members join the Society. Errata - photos of the Dutton Mercury on front cover and frontis are by Richard Haughey. 100pp plus 4pp colour cover. The first editorial by founder member and then-editor Brian Goulding. Experiences of driving a Ranger by Harry Pick. 2010 rally report by John Kilby. 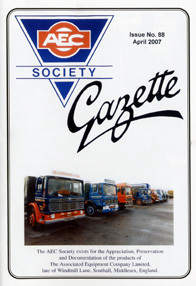 Experiences of a Gazette editor - John Whitehead, Issues 31 (Dec'92) to 66 (Oct'01). AECs from Graham Edge's files. Protus - a very special Regal. 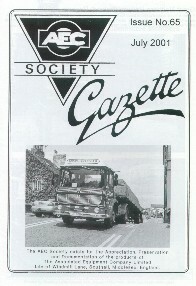 Experiences of a Gazette editor - John Andrews, Issues 67 (Jan'02) to 79 (Jan'05). London Transport's inherited Regals part 3. Hare & Hounds, Saturday May 15th 2010. Southall News – being part of AEC Ltd by John Andrews. Saving RT1 for the UK. Devon Regent Running Day on April 25th 2010 by Phil Platt. Progress with the Bullard's Brewery Monarch Mk III. 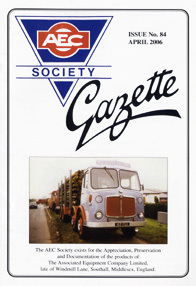 Camions Willème by Mike Lloyd. Regals in New Zealand by John White. Driving with Fridged Freight by Bill Robins. Progression of LT bus design with Alan Townsin. Minutes from the 2009 Annual General Meeting. Erratum - photo of McGovern Mammoth Major on page 70 is by Gyles Carpenter. 56pp plus 4pp colour cover. What's on in 2010 – including the Great North Road rally, May 29-30. Event at Walthamstow – 23rd May 2010. Lorris and buses at Southall in the 1950s – David Sharp supplied the photos. Cobham's got the UMP – an appeal for information. The AV/AH1100 – the story continues to unfold. The Society's Bomber County road run and Great North Road rally – organiser Jim Read provides the latest. Whisky Galore – Mercurys at work with Customs locked vans. 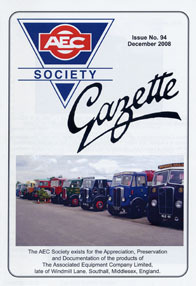 Colour section including Mercury tractor units, Kemble rally, HDK4 Dumptruk. Southall News – Peter Fryer recalls the final day of chassis production. 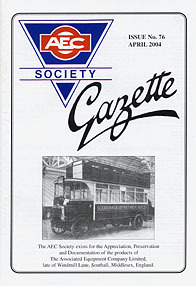 London Transport's inherited Regals – Alan Townsin and Gavin Martin provide the second of three instalments on the fleet of the early 1930s. Rallying to the cause – Lawrence Macduff recalls his journey south to Newark in 2008 at the wheel of a Reliance. Letters to the editor from Derek Thomas, Philip Hanwell, Nick Sloan and Tom Cooper. Fifteen new members join the Society. 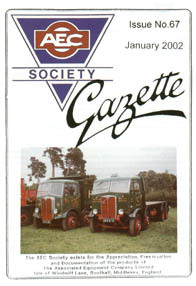 London Transport's inherited Regals – Alan Townsin and Gavin Martin begin an account of LPTB's Regals, starting in 1933. The 1100 engine - Tom Cooper continues with the history of this engine from an operational perspective. AEC's marine engines – propulsion and auxiliary: Harry Pick remembers their 'contribution to victory'. AEC numbering of passenger vehicle 'marks'. Southall News - Nick Sloan recalls his experiences both at and before Southall. The AEC/LT relationship – Colin Curtis recounts the special relationship which continued to exist after separation. Book reviews - AEC Matador Taking the Rough with the Smooth by Steve Richards and Saunders Roe Anglesey Ltd by the late Gerald Truran. Colour section includes two bonneted types in the centrefold. Letters to the editor from Ian Gooch, Alan Townsin, Brian King, John Tweedie, Harry Pick, Tom Copper and Chris Campbell. Thirteen new members join the Society. Showland buses – Glen McBirnie provides a nostalgic glimpse of what used to happen to AEC buses in their final years. The 1100 engine – Bob Fryars concludes his account of this product. Southall Snapshots - Messrs Hollingsworth concludes his review of Neil Johnston'sphotographs taken at the factory. The transport of West Ham supporters for the 1923 F.A. Cup. A brief history of a special RT. 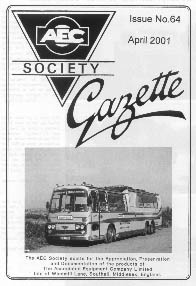 Colour section including Alton bus rally; commercials at Gaydon; Great Dorset steam fair. Southall News: from the AEC Gazette, July 1958. Life in the factory (1) – the laboratory by Ron Williams. Life in the factory (2) – engine test by Ron Moore. Photographic gems from George Lawn. Assebling the first postwar CKD kits in NZ – John White recalls some interesting techniques. A lifelong interest in AEC passenger vehicles – by John Allen. 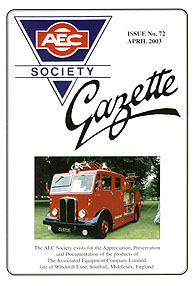 Experience of an AEC fire engine – by Brian Goulding. Letters to the editor from John Tweedie, Alan Townsin, Philip Platt, Peter E Baker to name a few. Eleven new members join the Society. The AEC Society annual rally – Robert Harris reports. The Crosville Matador – and a plea by Neil Fraser. The Great North Road rally – reflections by organiser Jim Read. The AEC 950/1100 engine – Bob Fryars writes with the first of two instalments on this intriguing and nearly forgotten engine. Southall Snapshots – Messrs Hollingsworth and Johnston with part two. 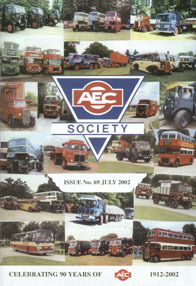 The AEC Society rally – RML owner John Kilby gives an overview. Some AECs never die – but they do metamorphose, by Mike Lloyd. 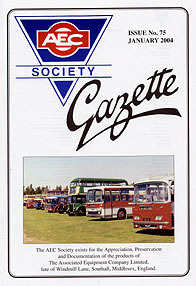 Colour section including Maltese buses; the AEC rally; the Hare & Hounds. Southall News: the Hare & Hounds gathering – Robert Harris reports. Memories of engine test and engine research – Ron Moore looks back. Memories of Southall – Geoff Lee concludes his reminiscences. 'Swinny' Grice and a Mammoth Major – recalled by Richard Cuff. AEC cab structures and cabs – by Peter E Baker. 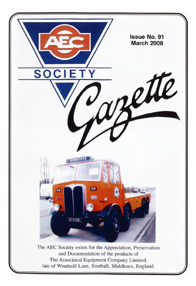 Letters to the editor on Regent & Texaco Mercurys; South African buses; AEC 590 Reliance and ZF gearbox; AEC in Iraq. Seventeen new members join the Society. 52pp plus 4pp colour cover. Carris AEC Regal on Portuguese postage stamp. Notice of a social gathering at lunchtime at the Hare & Hounds, Windmill Lane, Southall on May 16th 2009. Oxford Bus Museum's Hong Kong Regent V by Bob Gearing. AECs found by Phil Platt on holiday in Cyprus. Neil Johnston's Southall Snapshots, part one. Lawrence MacDuff recalls Reliances he has driven. 8-page colour section features the Mostyn Sawmill Matadors on the centrespread. AEC Staff news — Memories of Southall by Geoff Lee. John Allen looks at AEC buses in service in South Africa. Reminiscences of UMP227 and 3VTGs by Peter E Baker. Letters to the editor from Tom Cooper, Alan Townsin and Russell Howard. Two new members join the Society. Notice of the AEC rally at Newark Showground on May 23/24 2009. Situations vacant at the AEC Society: Secretary, Membership secretary, Rally organiser, Merchandising officer, Publicity officer. Bob Gearing retires as Chairman. Minutes from the 2008 AGM. AEC on the Web — recent photographic contributions to the AEC image gallery. Land's End to John O'Groats – John White's epic journey by Mk III Matador! 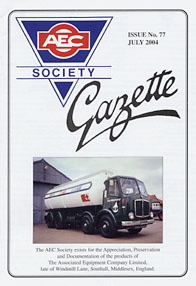 8-page colour section includes the Esso Mammoth Major tanker and John Manley with his Matador. AEC Staff news — part 4 of Frank Moloney's reminiscences. AEC Swift: Tom Cooper on Sheffield's last AEC bus. 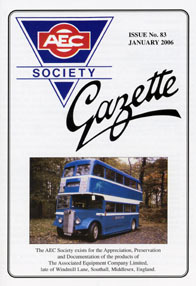 London's Great Bus Builders by David Luck. Letters to the editor from Peter Baker, Frank Maloney and John White. 52pp plus 4pp colour cover, more than 40 photos, many in colour including the centre-spread. AEC Regal VI Overseas Single-Deck Bus Chassis. Driver Certificate of Professional Competence (CPC) — an update from the FBHVC newsletter. AEC Engine development by Peter E Baker — every engine, petrol and diesel from the beginnings of AEC to 1950. Archive photos of AECs in new Zealand from John White's collection. 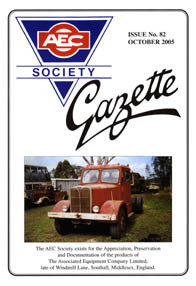 8-page colour section including as the centre-spread the AEC Railmotor operated on the Mary Valley Heritage Railway at Gympie, Queensland. AEC Staff news — Frank Moloney's penultimate instalment. Peter E Baker examines AEC's involvement in tank engine design. LEZ! Derek Funnell reports on the effect of London's Low Emission Zone on post-1972 commercial vehicles. Readers' letters — ten contributions in this issue. Seven new members join the Society. Fulfilment of a childhood ambition: Len Harris describes his experiences of working with London Transport's fleet. Summer holidays 1970: Graham Edge recalls extensive UK travels in one week in 1970 in a Mercury. Care of batteries: Tony Whitehorn of Muticell International gives some basic advice on battery care. The arrival of the 104 seater after its maiden voyage: Alan Townsin writes about a rather special bus from 1927. Brian Goulding reports on an operator using Routemasters on service in Nottingham. 2008 AEC Society Rally notes. AEC Staff news - Frank Moloney writes, in this second instalment, of his experiences with AECs in Australia and discussions at Southall to obtain necessary design changes. Readers' letters - eleven letters including those from Montevideo, New Zealand, Wick airport, and Spain. Colour photos include exhibits at the Commercial Vehicle show in April 2008. Twenty-seven new members join the Society. · Preserving a London Transport RF by David Jones. · Summary of AEC oil engines 1930-64 by Alan Townsin. · AEC prototype under-floor engined vehicles by Ian Barrett. · Restoration update from Jim Jordan on AEC Monarch Mk III DVG395. · AEC engine development by Bob Fryars. · AEC Staff News by Frank Maloney. · Forty years of West Coast Connections by Lawrence MacDuff. 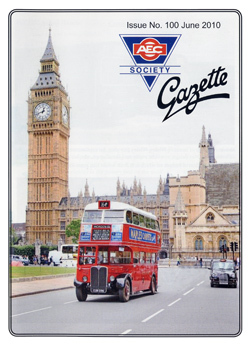 · How to order a copy of the Vintage Roadscene AEC Supplement. · Twenty-one colour photos & twelve b/w photos. · Six new members join the Society. 48pp plus 4pp colour cover. 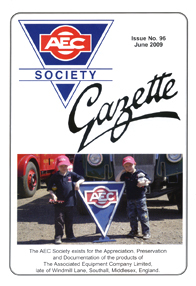 Congratulations to Gazette Editor Robert Harris for producing a very professional edition of the AEC Society Gazette. 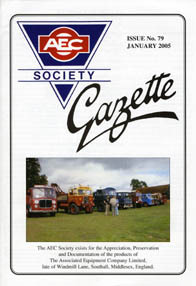 New features include a contents list, centrefold photo, members' forum for spares plus selected ads from other sources. 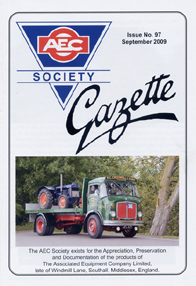 · From the AEC Gazette: New Zealand's first 8-wheeler. · Some questions on AEC engine development. · The late Bob Willoughby: an appreciation. · Matadors & Showmen post WWII. · AEC Staff News by Nick Sloan. · Sixteen colour photos & eight b/w photos. · Minutes of the 2007 AGM. · Date for 2008 AGM: November 1st 2008 at Coventry Transport Museum. · Photos taken at the 2007 AEC Rally. · Hawkes Bay Motor Co in the 70s & 80s by Tony Smith. · North Shore Merryweather fire appliances by Colin Prince. · By Winged Triangle to the Western Isles by Lawrence MacDuff. 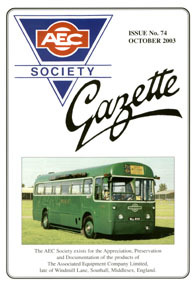 · A selection of Ian Allan bus books reviewed. · BRS days by Bob Pike. · AEC Rally 2007: Chairman's Report. · Extracts from the FBHVC Newsletter 3/2007. · Twenty nine new members. · Disaster at Ruddington - many vehicles destroyed. · AEC recollections by Tom Cooper. · Cairo to Tunis: AEC powered Matilda tanks. · The AEC Swift in Scotland by Lawrence MacDuff. · Norcot Timber Supplies Type 0854. · Darwin AEC Regal double-decker. · Some old photos of Southall Works. · Extract from the 'Uxbridge Leader' about the Diesel Shunter. · AEC Rally 2007: Comment from the Chairman. · Letter from Howard Berry. · Extracts from the FBHVC Newsletter 1/2007. · Overseas anecdotes from Robert Bennet. · Tilt cab AECs on timber work in late 1981. · NORWEB AEC mercury article. · 2006 Austumn Gathering & AGM. 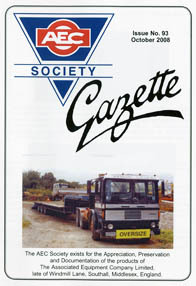 · Special Lorry Bodies described by Graham Edge. · Bowaters Mammoth Majors by Len Vasler of L.V.Transport. · Minutes of the 2006 AGM. · AEC industrial applications in New Zealand. · Sad Saga of the AEC V8 by Bob Fryars. 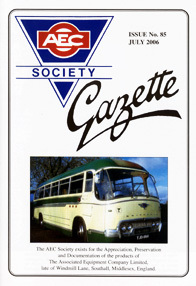 · AEC's 3VTGs by Robert Smith including rare colour photos! · Looking back at the ACV Gazette: "ACV Bring Home the Sugar." 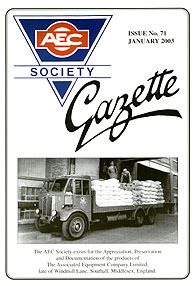 · Looking back at the ACV Gazette: "From Forest to Fleet Street." · Letter & photos from Brian Thackray. · Photos taken at the 2006 Wollaton Park Rally. · Mike Gilbert's 'Mutant Milly'. · The Charles Ashby Railcoach. · Wrecks in Western Australia. · Selection of 1930s chassis drawings. · Minutes of the 2005 AGM. · Selection of official AEC photos. · Chinnor & Princes Risborough Railway. · Red Ken see off Red Buses (uncredited). · The Editor's top ten AECs. · Audited accounts March 2004 to March 2005. · Photos from the Chairman. · Routemaster design final instalment by Bob Fryars. · AECs at war in the Falklands by Brian Goulding. · AEC Brill and Candian Car & Foundry. · Book review: Prestige Series No 31 Doncaster 1 by Roger Holmes. · Book review: Prestige Series No 8 West Riding 2 by D W Allen. · Book review: AEC Mandator by Graham Edge and published in August. · New Zealand diesel shunters. · Lancs & AECs together. · London Transport's Overhaul Works Float explained. 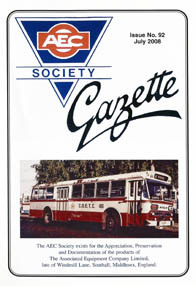 · Selection of photos inherited by the Gazette's editor. · Reply to Graham Edge's letter in Issue 79 from Robin Hannay. 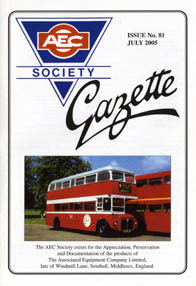 · AEC's contribution to the Routemaster design cont'd by Bob Fryars. · John Manley's early Matador 0853.005 by Harry Pick. · Mystery Leyland Marathon 6x4 chassis. · Nottingham rally report with many colour photos. · Restored AEC Mercury 5GM4RA EAU161C. · AEC-powered Diesel Railcar on the Severn Valley Railway. · Book reviews: Samuel Ledgard; United Counties. · Graham Edge responds to replies in Issue 80. · Captionless photos in colour from Gaydon. · Responses to Graham Edge's letter in Issue 79. · AEC 0854s at war. · Story & photos of former Barton Matador 0853 4326. · Review of the 2001 Matador & Militant Gathering. 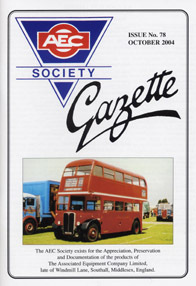 · AEC's contribution to the Routemaster design by Bob Fryars. · John Bryan's memories part 4. · Obituary: Gerald Truran 1936-2005. 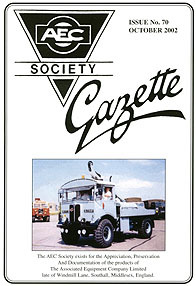 · Ron Stringer takes over as Gazette Editor. · Thirty one new members. · Southern Rally report and pictures. · AEC Vehicles Origins to 1929: book review by Brian Goulding. · Barton 1 & 2: book reviews by Brian Goulding. · Trent 1 & 2: book reviews by Brian Goulding. · On the Dambusters set with a Regal IV. · Was AEC doomed even without Leyland's involvement? asks Graham Edge. · New Zealand Merryweathers by John M White. · MacBraynes part 3 by LJ MacDuff. · Reports and pictures from Newark 2004. · Reports and pictures from RM50. · News from New Zealand. · Engine development and testing at Southall. · Working with Routemasters: book review. 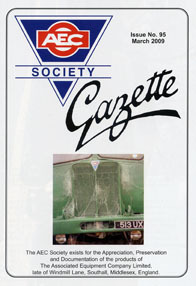 · GWR/AEC Railcars by Malcolm Margetts. · More about AEC 8x8 by Robert Bennett. · In memoriam: Roy Melland 1943-2004. · In memoriam: Julian Brinkworth 1956-2004. · History of MacBraynes part 2 by LJ MacDuff. · Forty one new members. · Replies to the AEC Buses in Malta article in Issue 76. · Nottingham City Fire Brigade by Brian Goulding. · Glenton Tours Diamond Jubilee. · Have You Ever Been Across The Sea To Ireland? by John Bryan. · Focus on Simon Gill, Director & Treasurer. · Brian Goulding's report on the LVVS Open Day, Nov 2003. · Unitrans RTs/RTLs by Brian Goulding & Michael Dryhurst. · History of MacBraynes by LJ MacDuff. · New Zealand Reliances by Nigel Branthwaite. · AEC 8x8 by Robert Bennett. · In memoriam: Bill Cottrell 1948-2004. · The Society is now a limited company, AEC Society Limited. · Minutes of 2004 EGM. · AEC buses in Malta, chassis details from Paul Jefford. · AEC buses in Scotland by L J MacDuff. · New Zealand Cement Company by John M White. · Bill Taylor's auction report. · The London Brick Company: book review by Mike Lloyd. · John Lock's AEC story, part 2. · Obituary: Bill Cottrell 1948-2004. · Minutes of the 2003 AGM. · London Transport's AEC Service Vehicles by Bill Aldridge. · Leyland Reliance reply from Mike Lloyd. · Nimon & Son Reliance of New Zealand. · Mammoth Minor reply from David Hawkins. 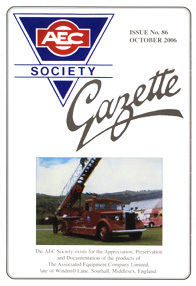 · Focus on Leo Morey, Membership Renewals/Gazette Despatch Officer. · Milled From Golden Fields: book review by Brian Goulding. · John Lock's AEC story. · 3rd Southern Rally report by Geoff Latham. · New Plymouth (NZ) Regal IVs by JM White. · Notice of EGM to be held at Sutton Coldfield on 20/03/04. · 21st AEC Rally to be held at Newark on May 29th/30th 2004. 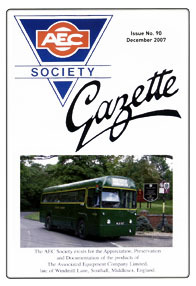 · 4th Southern Rally to be held at Chalfont on Sept 24th 2004. · Newark Rally reports by Simon Gill and Richard Cresswell. · 27 colour photos of AECs at the 20th AEC Society Rally. · Bradford and its Trolleybuses: book review by Brian Goulding. · Preserved bonneted Mammoth Major III in Australia. · AEC Gazette article on BRS. · Experimental Dept report on prototype AEC Regal IV, continued. · Brian Emery's Early Years with BRS & AEC, continued. · Archive photos of the teaboys at Southall Works. · A Mammoth Minor mystery by Graham Edge. · Notice of AGM to be held at Sutton Coldfield on 25/10/03. · Lincolnshire Road Car Regents. · Memories of BRS & AEC with Fred Emery continued. · AEC Gazette article on the Reliance. · Experimental Dept report on prototype AEC Regal IV continued. · Memento of a Mr Hollands' retirement in 1964. · Reproduction of W L Clifton's wartime Apprentice's Agreement. · A selection of photos of restored AECs. · Obituary: Brian T Davies. · Southern Rally details (Sunday 21st September 2003). · Focus on Richard Cresswell, Lorry Liaison Officer. · Twenty four new members. · David O'Farrell's AEC discoveries downunder in Australia & New Zealand. · Braking problems with AECs 1965-68 by R W C Smith. · 1937 AEC Gazette article on motor yacht '333' (3 AEC engines). · Lottery grant saves South Wales Bridgemaster. · David Allway's Southall memories. · Southern Rally confirmed for Sunday 21st September 2003. · Minutes of the 2002 AGM. · Focus on David Hopkins, AEC Society Vice President. · Ferodo Mercury & Monarchs by Brian Goulding. · AECs with Flour Millers by Graham Edge. 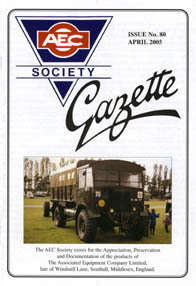 · J M White's history of Hawkes Bay Motor Co.
· The AEC Gazette's War, first published in December 1968. · AEC Mustang & Marshal: Book review by Brian Goulding. · Focus on Gordon Baron, AEC Society Vice President. · David O'Farrell's report on the 6th Matador & Militant Gathering. · 12 Years of AEC 1951-1963 by George Lawn. · A Tale of Two Reliances by Peter Burton. · North of England Two Day Road Run by Bob Smith. · Water Pumps by Ian L Reid. · Memories of AEC in New Zealand by John White. · Focus on Harry Pick, AEC Society Life President. · More AEC90 photos taken by Brian Goulding and Ron Stringer. · Alan Hobbs' poem "Ode to AEC90 Rally". · Obituaries: D A Clark (M/532), H Franks (M/669), A Tyson (M/487). · Editor requires articles for the next issue! 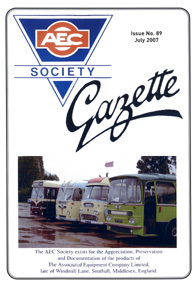 · 22 pages of AEC90 photographs taken by Brian Goulding. · Rally Report by Richard Cresswell. · 4 pages of AEC90 photographs taken by Ron Stringer. · In the Highlands & Islands: AEC and MacBrayne's by Lawrence McDuff. · Paul Goode's Marshal VYN 125G restored. · Focus on Bob Gearing, AEC Society Chairman. · Rally & Events co-ordinator still wanted. · Fifty five new members, with many enrolling at AEC90. · AEC Dumptruk Range by Graham Edge. 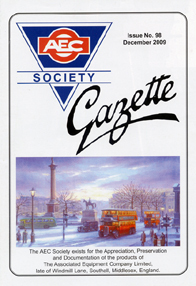 · AEC Trolleybuses by Michael Dryhurst. · The "M/V ACLO" by Bob Fryars. · Prestige Series No 15 Nottingham: Book review by Brian Goulding. · Looking back at AEC in the 'fifties with Roger MacDonald Smith. · Martin Perry's photos of Gloucestershire Reliances. · Focus on Brian Goulding, AEC Society Founder & Vice President. · Countdown to AEC 90 on May 25th/26th 2002. · Rally & Events co-ordinator wanted. · No Southern Rally this year. · Amberley Bus Show review. · Aussie survivor: Mammoth Major 8 Mk III. · AECs in Miniature by Grahame Hawkyard. · AEC Mercury: Book review by Brian Goulding. 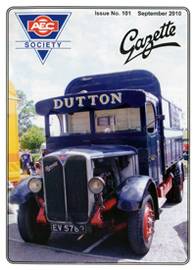 · British Commercial Vehicle Museum Trust. · Memories of Maudslay Motors. · Focus on Graham Edge, DVLA Liaison Officer. · Minutes of the 2001 AGM. · Appeal for help with the 2002 Southern Rally. · Luxemburg Municipal Transport Museum. · Hybrid timber tractor by Richard Elwell. 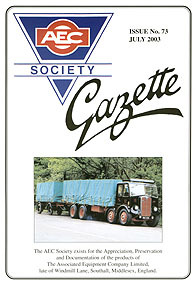 · Classic lorry photos by Pat Honey. · New Zealand armour by J M White. · Photo feature: Wall's AEC lorries. · Export Market Memories by Robert Bennett. 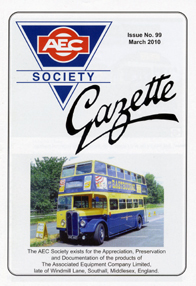 · Devon General AEC buses by Philip Platt. · Militant chassis No 0880.001 by R W C Smith. · Cover picture of Smith's of Reading Reliance JDP 520. · Appeal for help with AEC 90 by Graham Edge. · Vacancy for Merchandising Officer. · 2001 AGM to be held on 27th October 2001 in Sutton Coldfield. · 2001 HCVS London-Brighton AEC Entries & cup winners. · 2001 Road Run and Annual Rally illustrated report. · AEC Memories by Bob Willoughby. · Matador 4x4 Post War production by Richard Cuff. 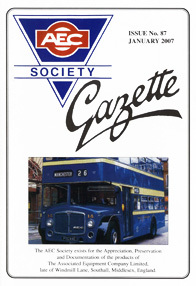 · Review of Routemaster Handbook (3rd edition). · Cover picture of Graham Edge's Mandator. · Vacancy for Gazette Editor. · Twenty two new members. · Directions to the Southern AEC Rally on Sunday 23rd September 2001. · UTIC-AECs in Madeira by Lawrence Mc Duff. · Portguese Pictureview by Brian Goulding & Paul Richman. · A fond farewell to Abbotts of Blackpool. · Holiday Memories by Michael Dryhurst. · Restoration of Marshal 6x4 VYN 125G by Paul Goode. · AV760 Road Test by R G Willoughby. · John Whitehead's review of The AEC Story Part One by Brian Thackray. · Cover picture of a six wheel Reliance! 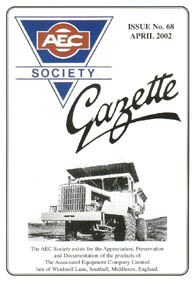 · Vacancy for Gazette Editor as John Whitehead is to stand down. · Mr Harry Pick no longer involved in the affairs of the Society. · Minutes of the 2000 AGM. · Twenty three new members, including a certain Jonathan Hayles! · Southern AEC Rally confirmed for Sunday 23rd September 2001.